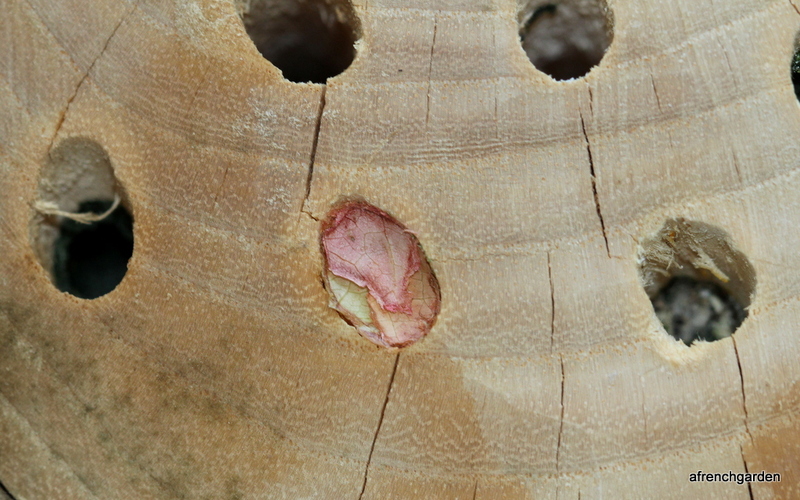 On the fourth of September last year I noticed a hole in my bee hotel had been beautifully sealed by carefully arranged sections of rose petals. 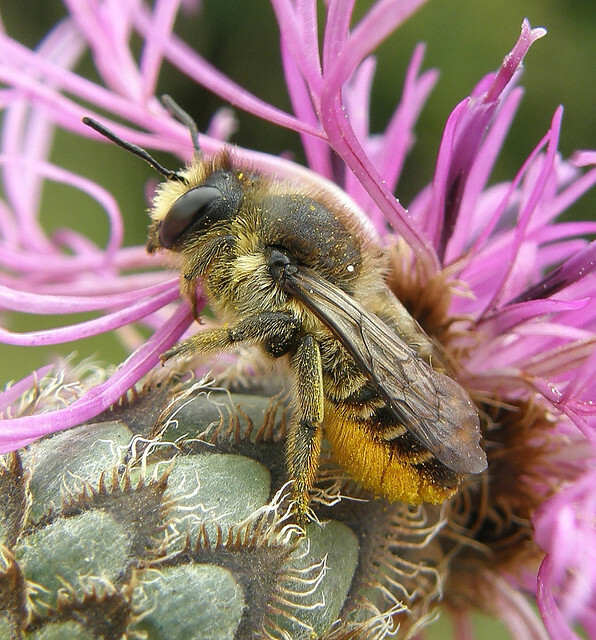 (See Some Megachile). 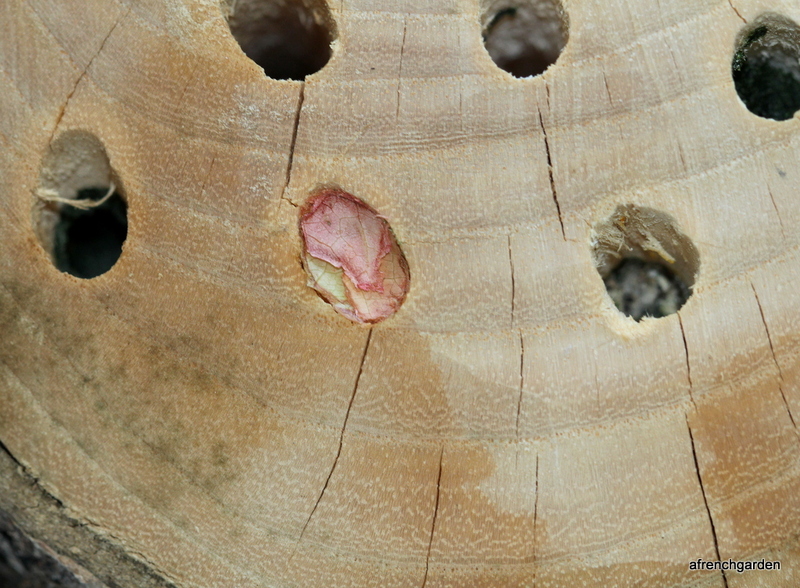 On the 24 of May this year I noticed a hole had been chewed in the centre of it. I could not resist removing the remains of the rose petals to get a better look. 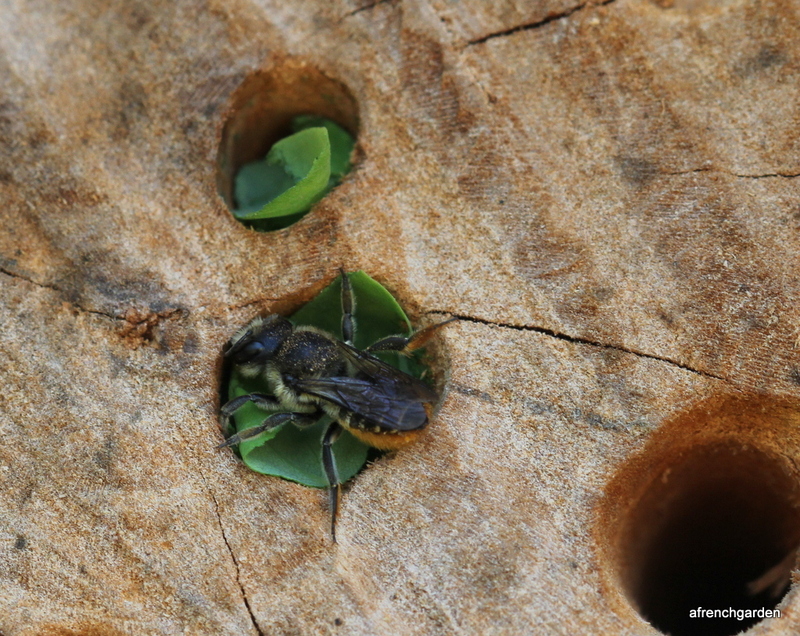 A new little bee was making her way into the world. However, it was 19.20 and domestic duties called and the light was fading for photographs. 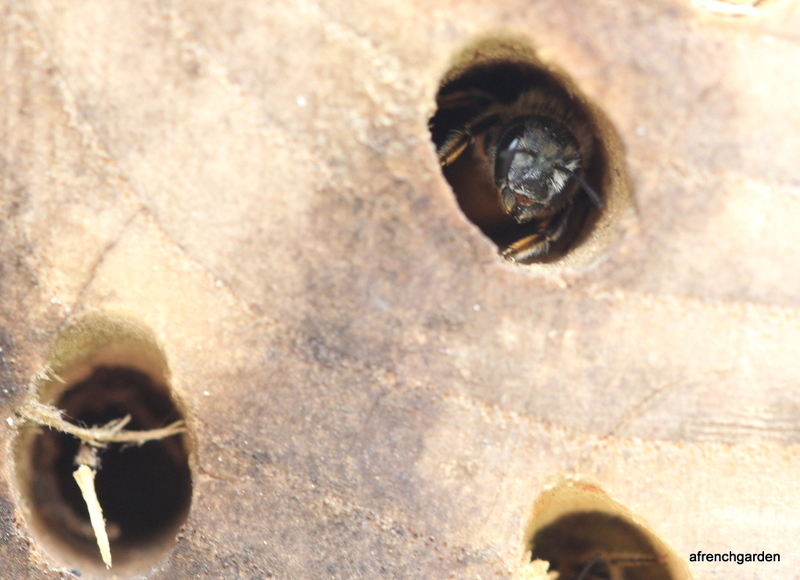 It was 11.04 the next morning before I was able to get back to my bee and she seemed just to be waking up. Seven minutes later and she was not making an enormous progress. Then two minutes later there is movement from the hole above her. Now which one should I focus on? The other one is larger and not the same species. Very interesting but I do not want to lose my rose petal bee. 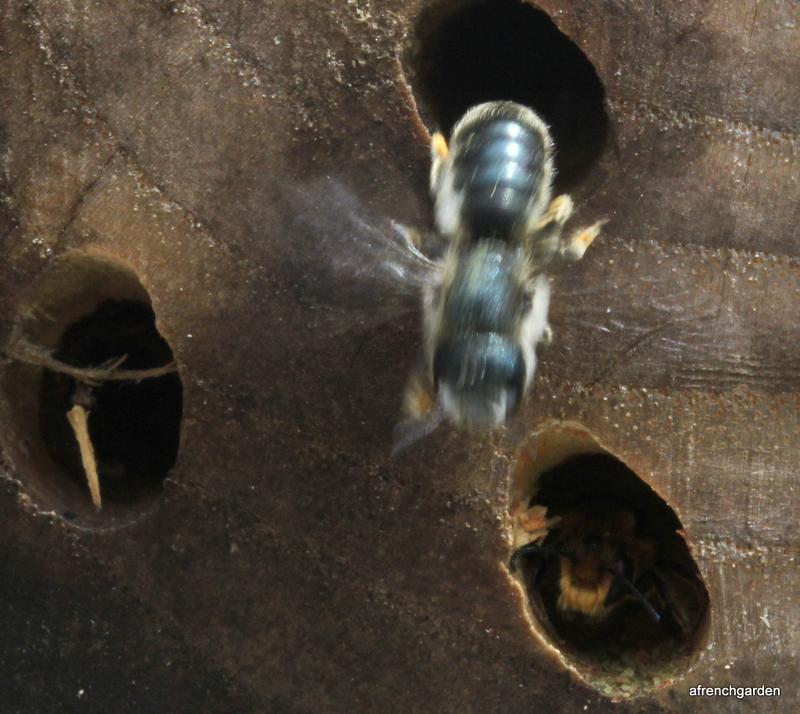 After a couple of minutes hesitation the big bee launches itself into the air. Sorry about the blur but it was the best I could do. I have no idea what species it was. 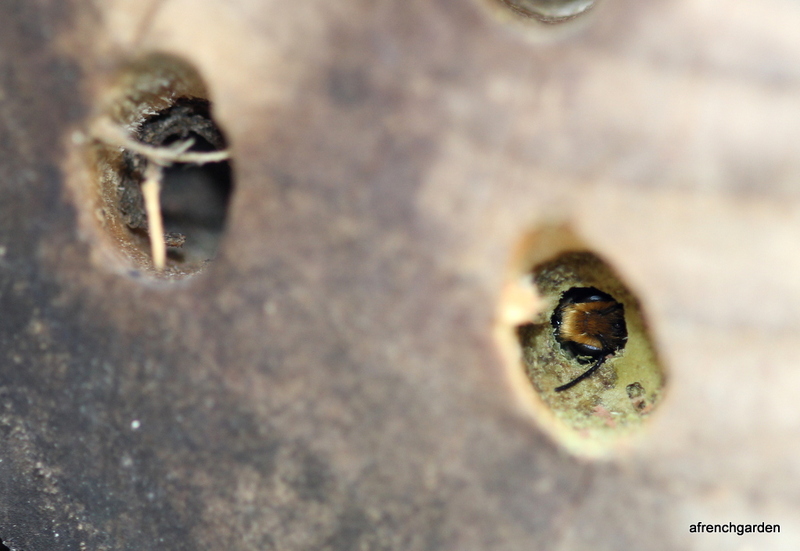 Back to my rose bee that has been emerging gradually for the last 34 minutes. 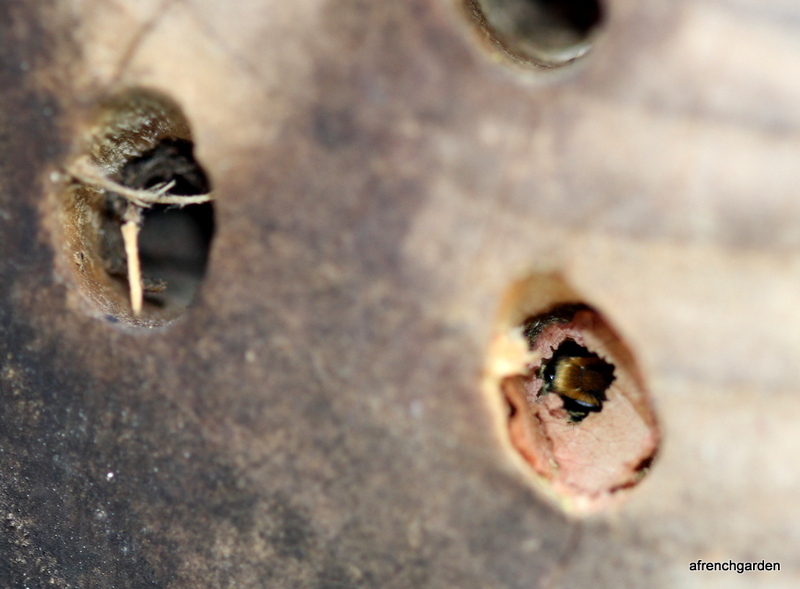 She seemed to have a considerable difficulty pulling herself through the little hole she had chewed in her leaf capsule that had been her home since last September. 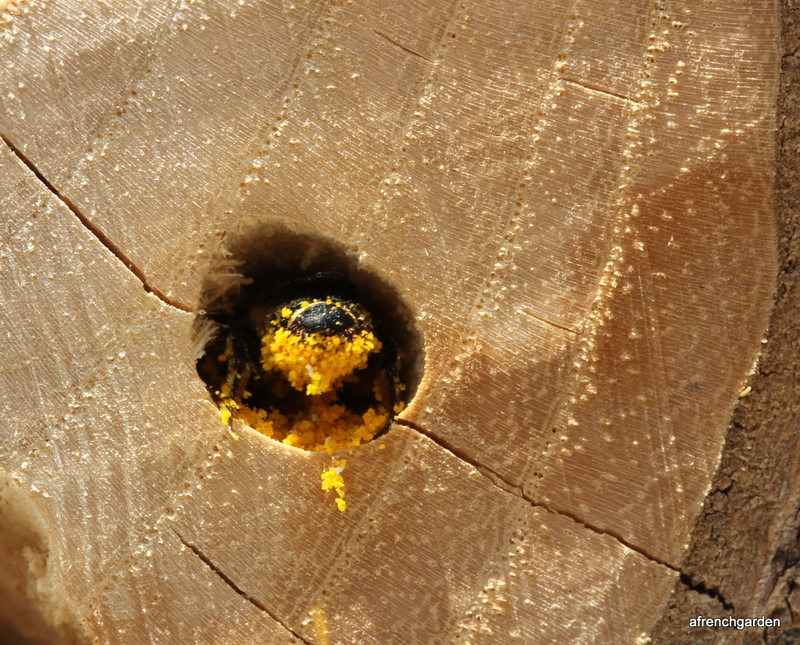 Finally after watching and taking photographs of her for 35 minutes she emerges onto the outside of the log. She paused momentarily before taking off. After this first one, many others emerged from the same hole in the following few days, usually taking less time to exit than this first one. 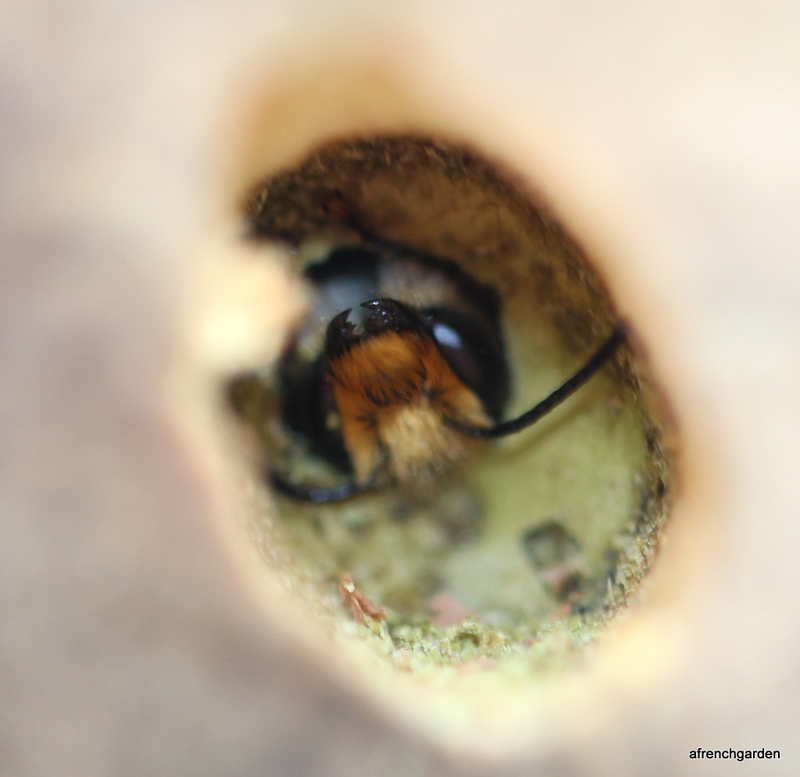 Sometimes it looked as if the bee next in the queue was giving encouragement from behind because as one took off, another little head appeared at the hole. However, I am not certain what species of leaf cutting bee she is. 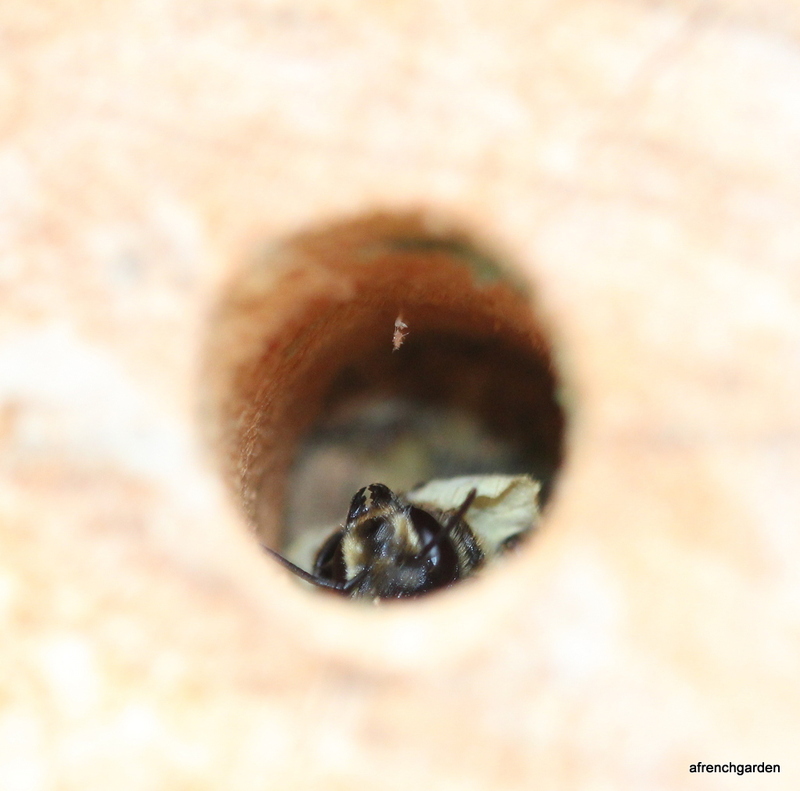 Megachile centuncularis are well known for their use of rose petals which points me in this direction. 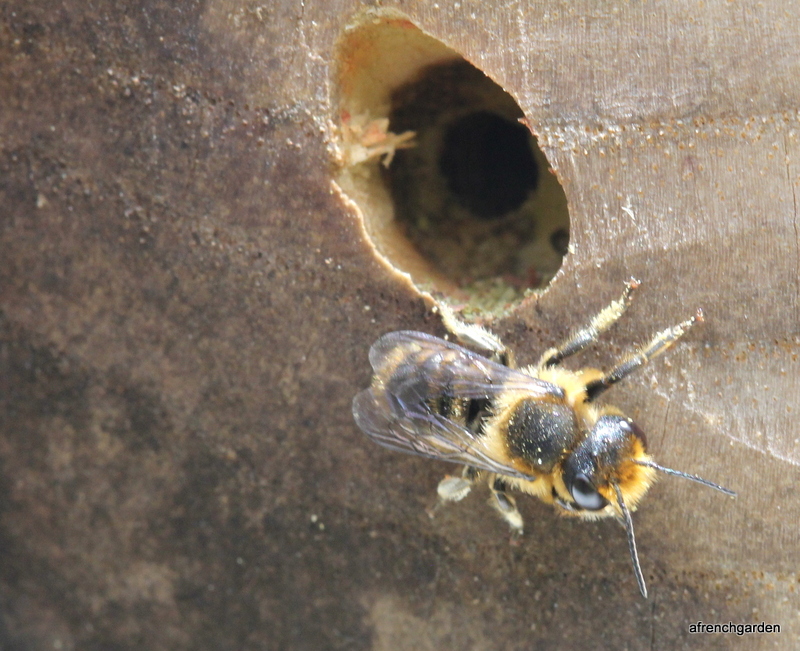 It is a common bee and I have seen bees looking like Megachile centuncularis on the bee box last year. 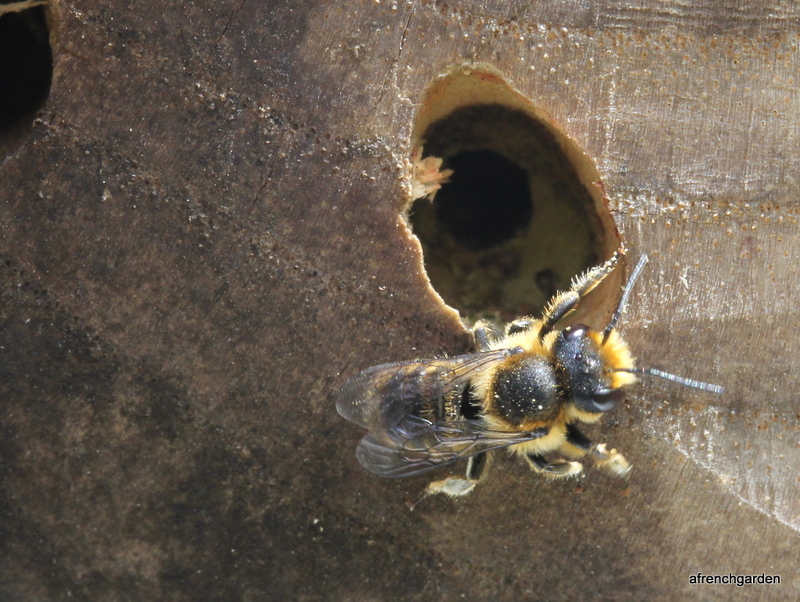 Could this be Mummy emerging from another hole in the log on the 26 August last year? , he says females can be distinguished from some other British species by the bright orange pollen brush that remains orange haired to its tip (black-haired at tip in some others). 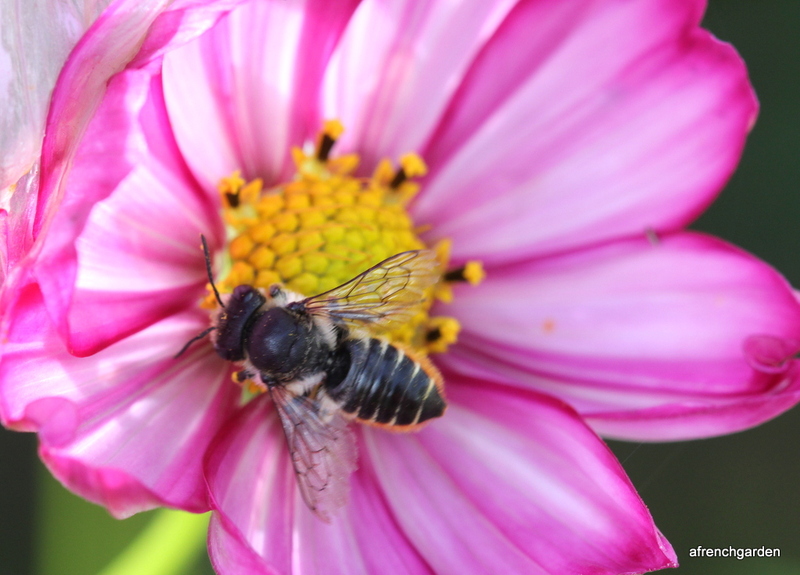 Well, even if I cannot be 100 percent sure of my French bees at least I can say I breed beautiful bees! 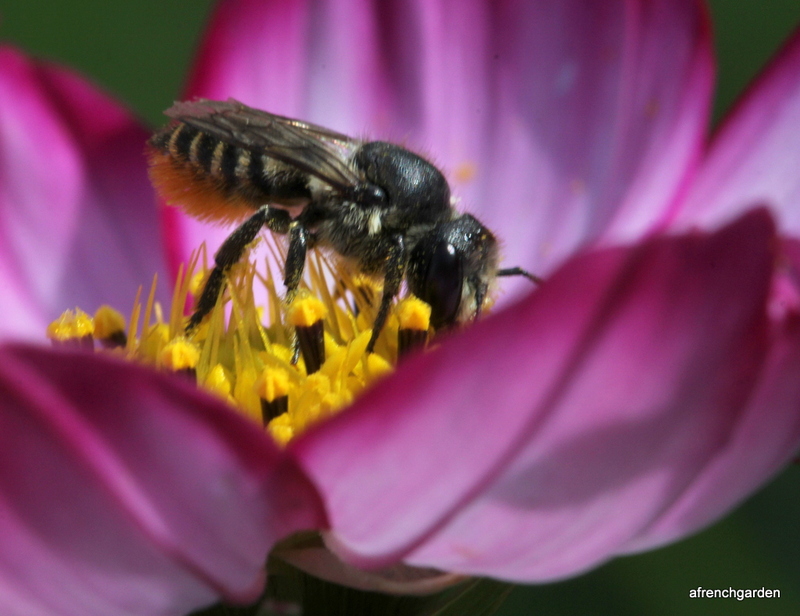 Megachiles collect their pollen on brushes under their abdomen. The colour of these hairs can often be used to help identify the species. 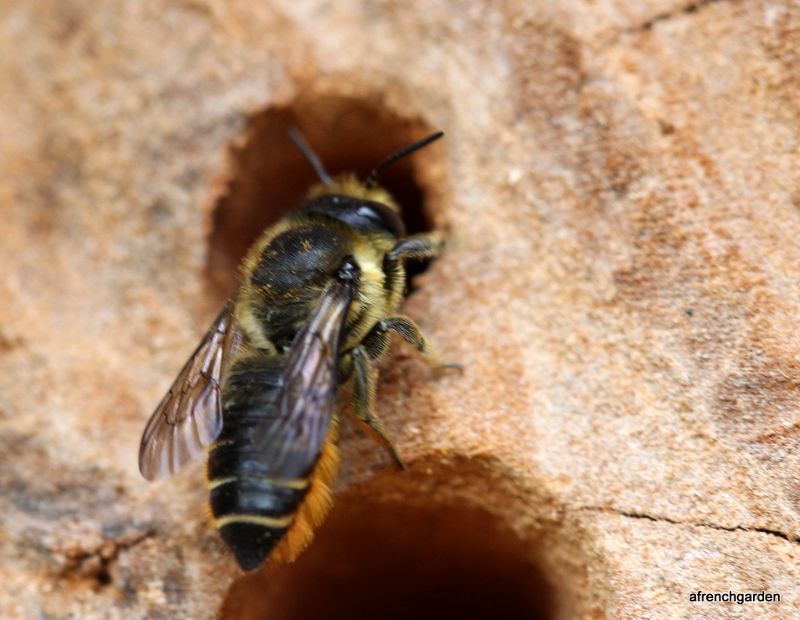 But as with anything else used in identifying bees – it has its limits. 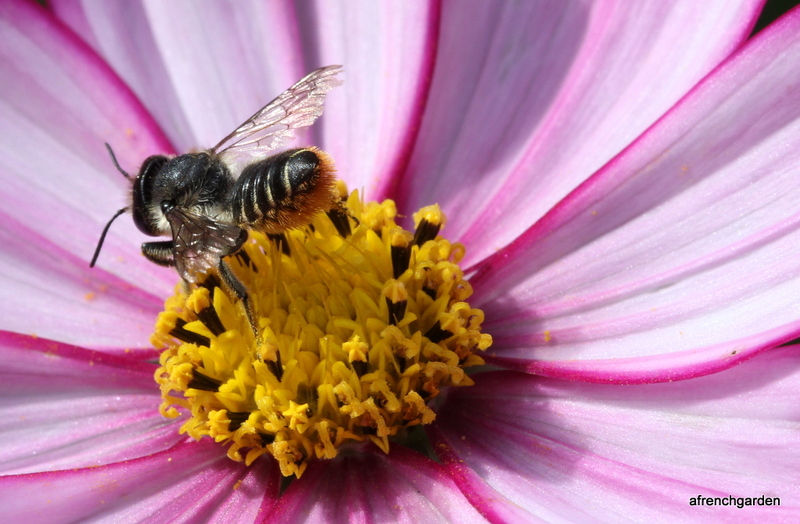 The underside of the bee can look the same colour as the pollen when it is heavily loaded. That’s a good load of pollen! 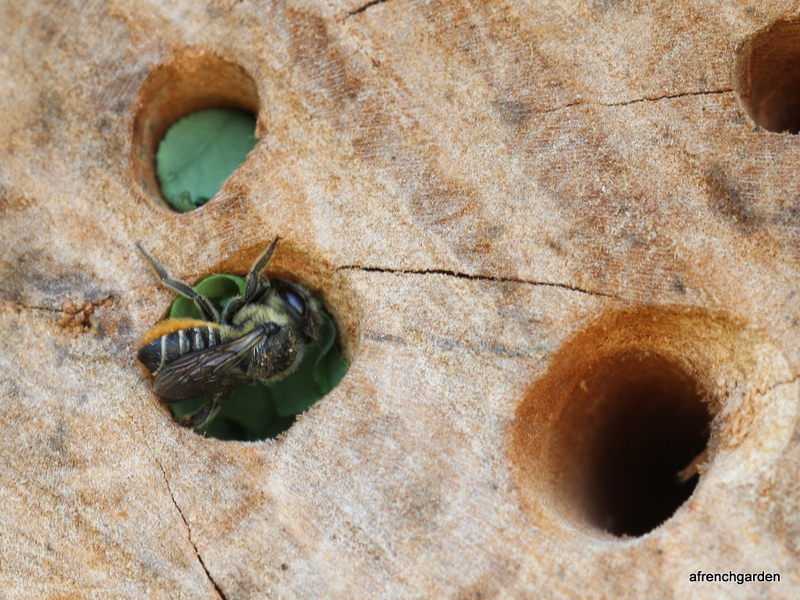 They are commonly know as leaf cutter bees as they choose already existing holes and line them with leaves to lay their eggs with a pollen and nectar store before sealing the cell with more leaves. They choose leaves that can be manipulated easily from trees such as lilac, ash or cherry or flower leaves such as roses or even rose, poppy or geranium petals. You can see her determination to fit this piece where she wants it. 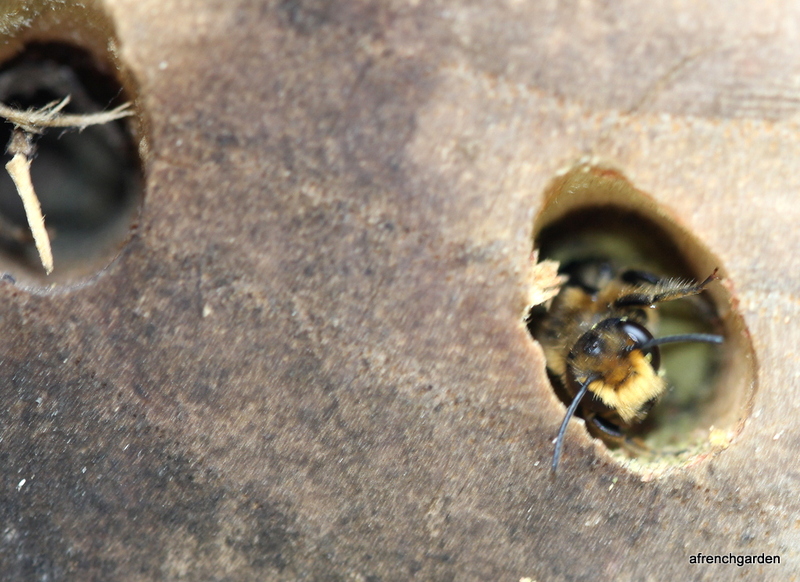 This shot was taken in my home-made bee hotel and I recommend trying one out as they are fascinating bees to watch. This one was a late riser. Perhaps she had had a busy building job the previous day. It was 9.49 a.m. on the 26 August 2013 and she was still asleep with the last leaf she had brought home acting as a blanket. 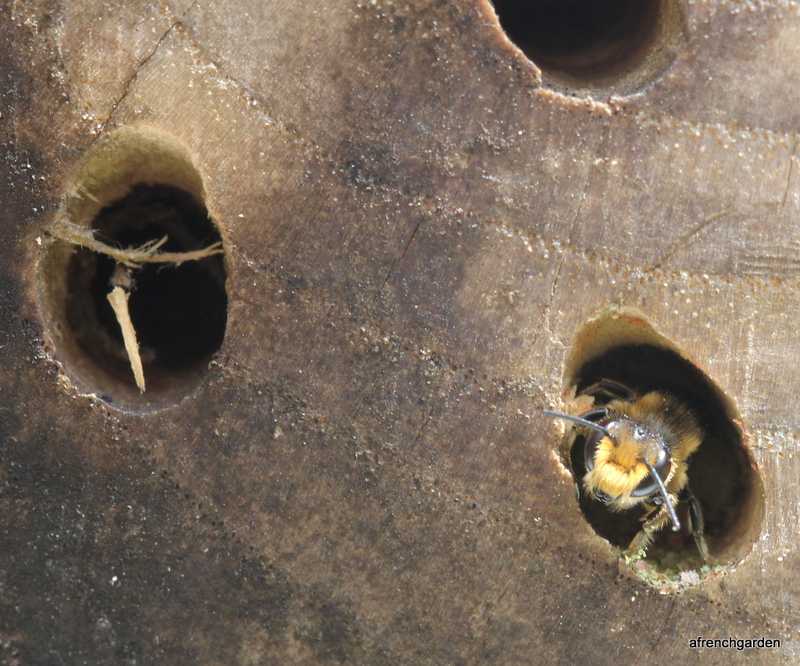 On the 4 September 2013 one of the bees finished off their nest with rose petals – class! I’m going to go for a photographic ID (i.e. 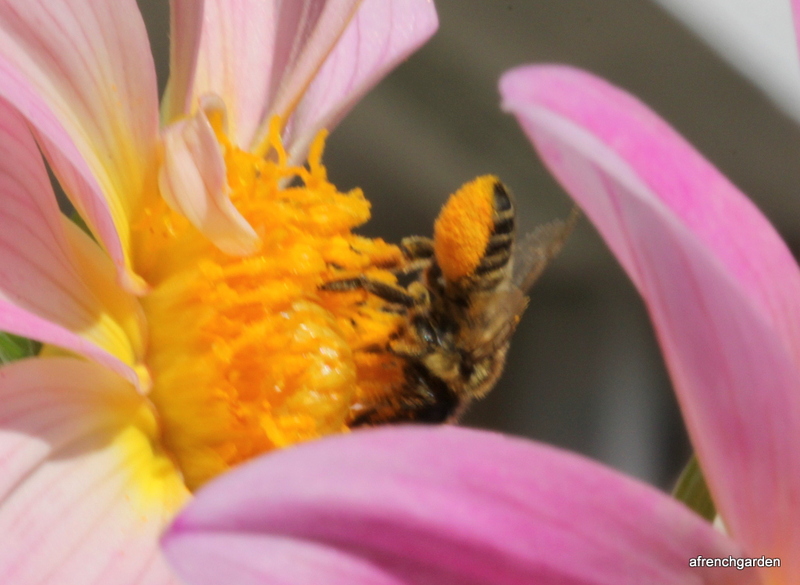 not an expert one) and say that this is Megachile centuncularis on my dahlia at the beginning of October 2013. 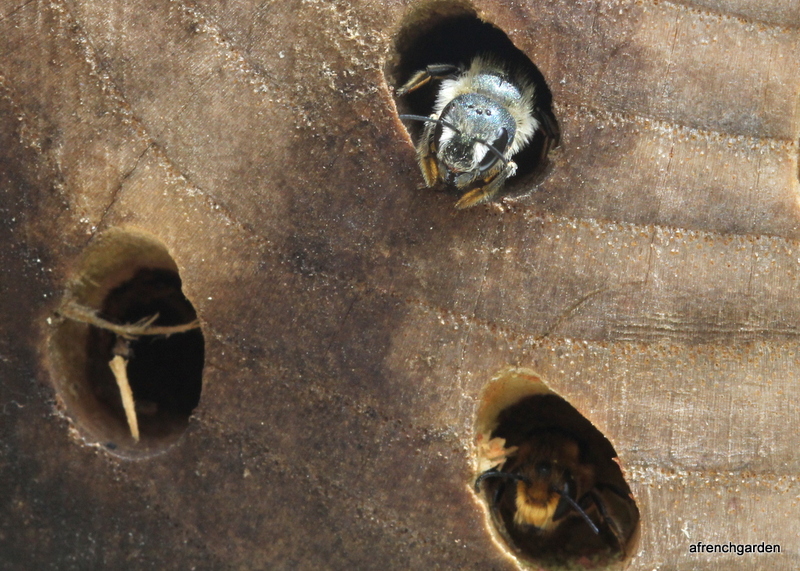 These are the bees I believe are nesting in my bee hotels. In addition, the wing venation checks out with the images I’ve seen. 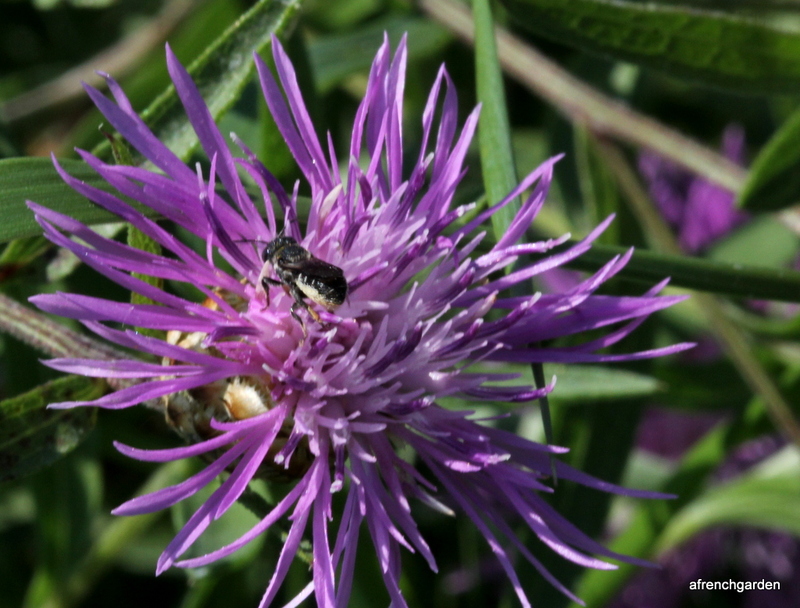 But there are other bees that look like Megachile around, like this tiny black one on Centaurea nigra in early August. 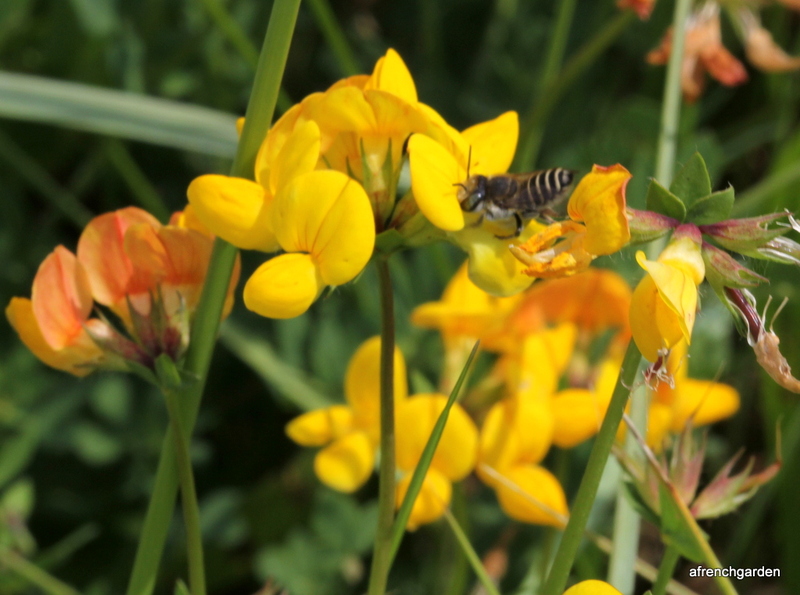 And this one with green eyes on Bird’s Foot Trefoil in late June (I think probably, Megachile leachella). Although these last two may be tricking me with their ventral pollen brushes as Osmia and Lithurgus bees have ventral pollen brushes too. 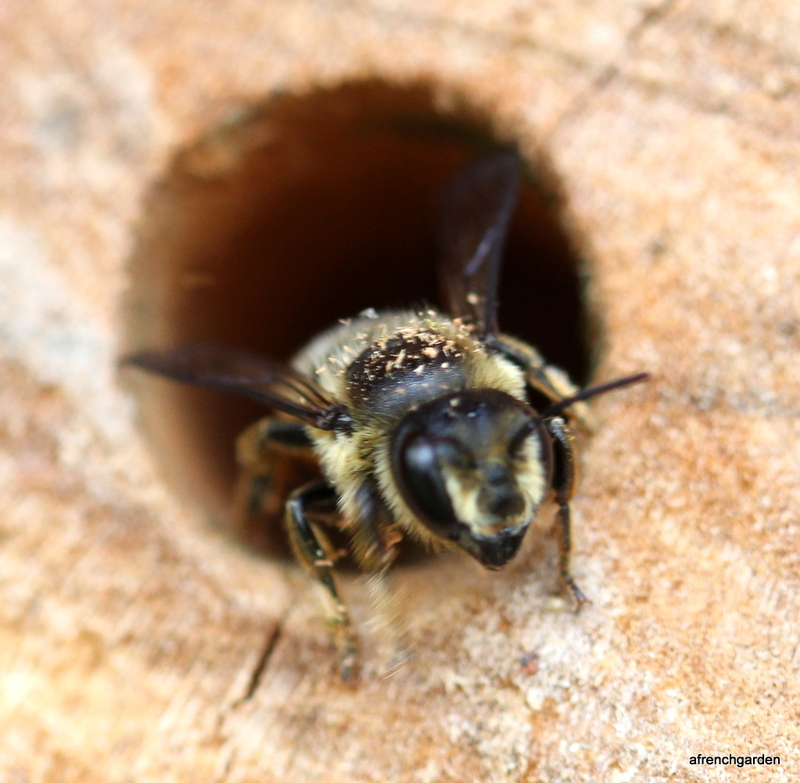 But I’m as satisfied as I can be that she is Megachile centuncularis.